I started using Goodreads last year (I know, right? super late!) to track my reading after I got a Kindle Fire for graduation. 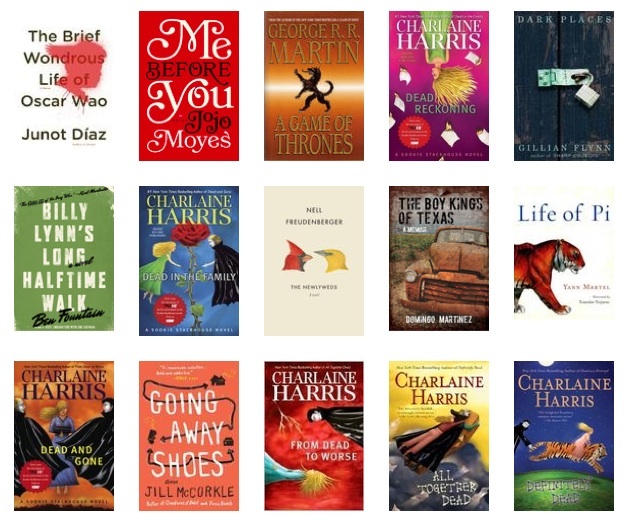 I set a goal to read 20 books for 2013. Well, as of last night I’ve got five to go and three weeks to read them. I also have stacks of magazines that I’m behind on (I have about 12 subscriptions – yes! to those print things with words and pictures! ), but nonetheless, I really made an effort to carve out time for reading. My favorite book was The Brief Wondrous Life of Oscar Wao. We joined a gym in January. No, not because of resolutions. Mostly because I needed something to get me out of the house during my first bitter winter back in the Heartland. A couple of weeks into our membership, I decided to check out a spinning class. I got there about five minutes before class started. It was full. Whomp whommmp. I went back the next day – about 15 minutes early – got myself a bike, asked for help adjusting it and a few pointers, and the rest is history. I’ve been to spinning at least once a week since that first time (except for a couple of weeks I was out of town). I usually hate getting ready to go to the gym, the drive there, and usually the first 15 minutes of class, but afterward I always feel amazing (in an exhausted way) and so grateful that I went. I love both of these “habits” so much that I’m sure keepin’ on in 2014 won’t be a challenge. I would’ve liked to add blogging to the mix, but I fell off the Think Kit wagon pretty early. Perhaps that’ll be my habit for 2014. This entry was posted in Personal, Think Kit and tagged Goodreads, habits, Think Kit, traditions. Bookmark the permalink.